Santorio Santorio, La medicina statica. 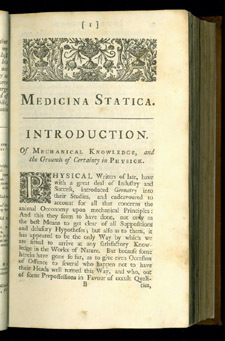 This is an image of the title page and frontispiece in our 1743 volume. Santorio is placed in a more elaborately drawn room and has longer hair than shown in the 1737 edition. The Italian physician Santorio Santorio practiced medicine and was professor of medical theory at the University of Padua. 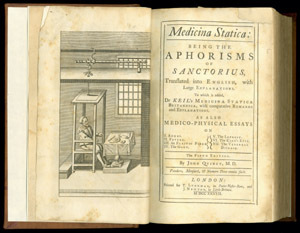 His writings demonstrate the transition taking place in medicine as Hippocratic and Galenic theories were seriously questioned. Santorio helped foster the importance of physiology and became part of the Iatrophysical School that emphasized the use of math and physics to gain an understanding of physiological processes. Santorio made more than theoretical contributions to science and medicine. He is credited with inventing a wind gauge, a water current meter, the “pulsilogium” to measure the pulse rate, an instrument to remove bladder stones, and a trocar to drain fluid from cavities. Both he and his friend Galileo mentioned the thermoscope, a precursor to the thermometer. There is debate over the actual inventor, but it is known that Santorio was the first to add a numerical scale to the instrument. 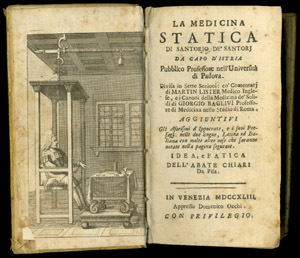 In 1614 Santorio published Medicina statica, the first systematic study of basal metabolism. Praised by his contemporaries, this well-received work was printed in many editions and translations over the next century and a half. Our 1737 edition is an English translation by Dr. John Quincy with additions by Dr. James Keil and Dr. Quincy. next author: William Harvey (1578-1657).